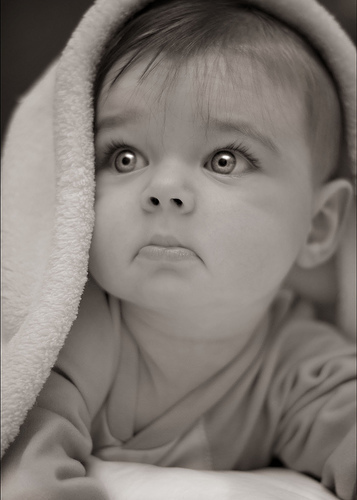 You are here: Home » Quick Tip: How to Take Gorgeous Infant Photographs? Quick Tip: How to Take Gorgeous Infant Photographs? In my friends circle, it’s babies galore this year! More than half a dozen of my friends have had the wonderful moments in their lives welcoming a newborn into their family. Congratulations Kannan, Prasanna, Ravi, Suren, Vinod, Murali, Karthik & Ravi! I thought of you guys when I came across this article on 5 Tips for Gorgeous Infant Photographs. As I recently experienced with Kannan’s boy, taking a picture of an infant isn’t an easy task. Also, 3 Quick Newborn Photography Tips also has some good ones in there. Or you can get down to the basics with Baby Photography 101. Enjoy your fatherhood fellas! This one is for you. I’m lucky; I’ve always been able to take great kids photos. The key is to get them to forget you’re standing there with the camera. It might require a retake or 28, but you’ll generally end up with something most memorable indeed. .-= Barbara Ling, Virtual Coach´s last blog ..False Profits – Why you should NEVER trust online income earning claims =-.